I’m re-reading this classic story for a book club that I’m in, and wanted to share some thoughts about it. I first read it back in my undergraduate days. John, his wife Fanny, and their 4 y.o. son move into Norland. Fanny takes account of the estate and convinces John to give his step-mother and half-sisters a small allowance to live on. 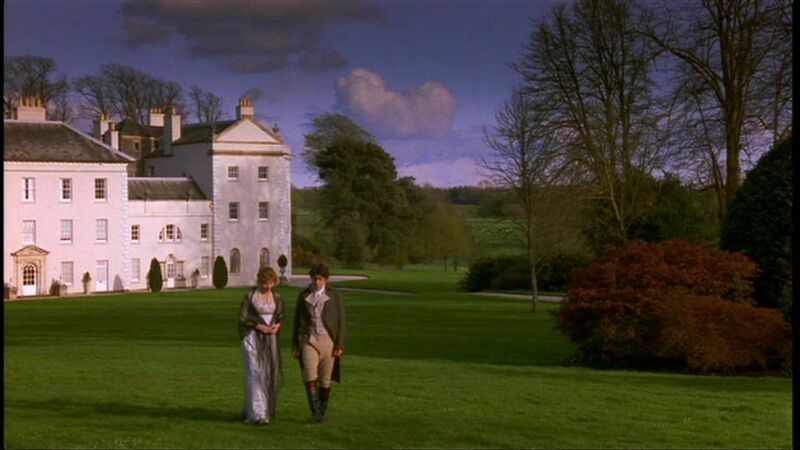 Elinor (Emma Thompson) and Edward (Hugh Grant) stroll through Norland in director Ang Lee’s 1995 film. 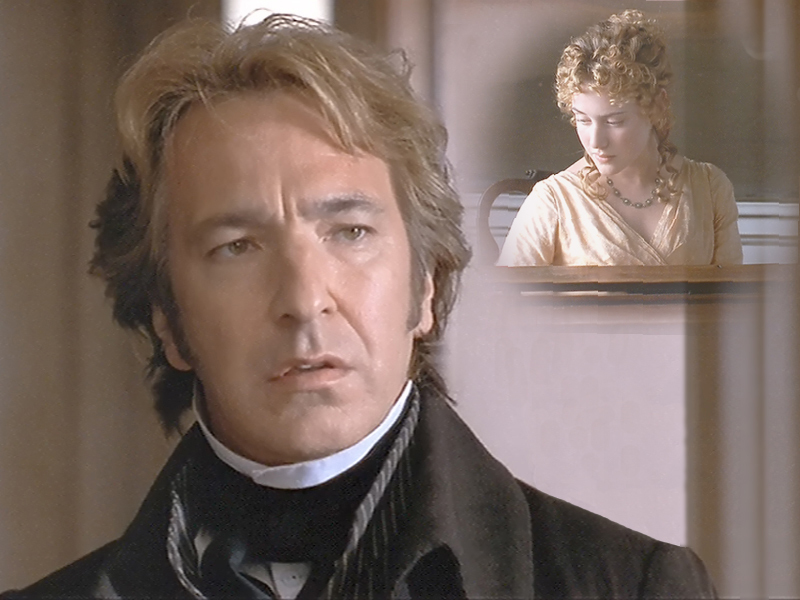 Col. Brandon (Alan Rickman) sees Marianne for the first time. The Dashwood ladies move to Barton Cottage in Devonshire, close to Mrs. Dashwood’s cousin, Sir John Middleton, who resides at Barton Park. He is a good-natured gentleman who loves company of all ages. The ladies adapt to their new (humble) life with few servants and new neighbors/friends: the Middleton family, Mrs. Jennings (the matchmaking mother of Lady Middleton), and Colonel Brandon (a 35 y.o. gentleman who enjoys hunting and music). He is still a bachelor and resides at his estate (Delaford) for most of the year. He has a young ward (who some rumor to be his illegitimate daughter). Col. Brandon has a partiality toward Marianne (often called “a beautiful girl”). She is passionate, musical, and bears a resemblance physically to his first/only love. On one of her usual long walks, Marianne sprains her ankle and is assisted by a young gentleman, Mr. John Willoughby, of Allenham. He is in his mid-20s, very handsome/stylish, loves dancing and reading. Also, he’ll inherit a fine estate (Combe Magna) in Somerset. It seems like he was made for Marianne, who quickly falls in love. They spend all their free time together, which leaves no doubt of their attachment to each other. Elinor cautions Marianne, but she doesn’t listen. Intro of Charlotte (the jovial second daughter of Mrs. Jennings) and Mr. Palmer (her droll husband who is going into politics). They come for a visit and reveal that they are expecting a child. Their estate (Cleveland) is not far from Combe Magna. Willoughby quits the country unexpectedly, saying that his aunt (Lady Allen) requires him to be in London. Marianne is very shocked/upset, but says nothing regarding their engagement. Everyone assumes that the couple is engaged. Edward comes for a (brief) visit to Barton Cottage, but he looks unhappy/distracted. They notice that he is wearing a ring with a lock of hair set inside. When asked, Edward says it’s Fanny’s hair. Though they have little in common, the Dashwood girls and the Miss Steeles are thrown together in company. Suddenly, Lucy confides to Elinor that she and Edward have been (secretly) engaged for some time, shattering Elinor’s own hopes. Lucy fears what could happen if Fanny and Mrs. Ferrars ever found out, and swears Elinor to secrecy. “I know he looks on you quite as a sister,” Lucy comments. Everyone is prepared for a picnic at Delaford, but Col. Brandon quickly rides off after receiving a letter. 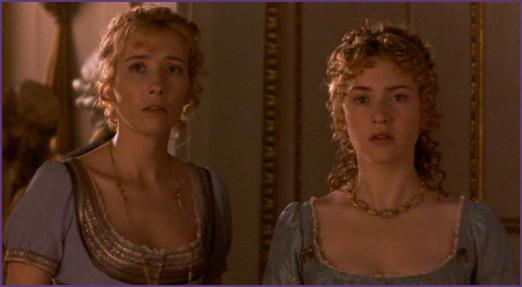 Mrs. Jennings decides to take the young ladies to London; Mrs. Dashwood approves greatly. Edward comes to call on Elinor, but finds that Lucy is also there. It is a very awkard situation; Elinor is the only one who is composed enough to deal with the needed niceties. When Marianne comes down, she is overjoyed to see Edward. Marianne, after getting no replies from Willoughby, is ecstatic to meet him at a large public assembly. He is cold and curt towards her, speaking more to Elinor regarding general matters. He goes off to be with his companion, a tall and elegant lady. Marianne nearly faints on the dance floor. The next day, Marianne finally gets a letter from Willoughby- it breaks her heart. Elinor is shocked, and tries to comfort her sister. Mrs. Jennings gets more details- Willoughby is engaged to a Miss Grey with 50,000 pounds. Col. Brandon reveals why he had to leave the picnic to Elinor. He also tells her about his past and reveals Willoughby’s true character. As a boy/young man, Col. Brandon loved his cousin. They hoped to elope, but were found out by his father. Col. Brandon’s elder brother married her instead and got hold 0f her large fortune. “She suffered much from him,” and eventually they divorced. The lady became pregnant by her first lover, spent all her money, and lay dying in a poorhouse. She gave her young daughter to his charge before the end. As for Willoughby, he seduced a 15 y.o. schoolgirl he met the previous year in Bath. This girl (Eliza Williams) became pregnant, with no assurance from her lover. Col. Brandon says that he “challenged” Willoughby (to a duel), and both men came away unharmed. This seems extreme to Elinor, but she says nothing. Elinor tells Marianne what she has learned about Willoughby. Marianne listens quietly and it seems like she still has some sympathy for the man. At a shop, the Dashwood sisters see a fastidious young man ordering a toothpick case. He turns out to be Edward’s younger brother, Robert. Anne unmindfully lets slip that Lucy and Edward are engaged while the Steeles are staying at John and Fanny’s townhouse. Fanny has a fit, throws the girls out, and takes to her bed. Mrs. Ferrars is also furious. She disowns Edward after he refuses to break off the engagement and marry Miss Morton. When Marianne learns of this, she feels terrible for what she said earlier to Elinor regarding her reserve. Elinor suffered a broken heart, too. John thinks that Col. Brandon wants to marry Elinor, since they spend a lot of time talking. He says that it’ll be a fine match, since the colonel has money, lands, etc. Col. Brandon (via Elinor) offers the parsonage at Delaford to Edward. (Mrs. Jennings overhears some of their conversation and thinks that the colonel is proposing to Elinor. Later, the two ladies have a laugh about this mistake.) When he hears of the living from Elinor, Edward is speechless. Elinor says that he still has friends, even though his family has cut him off. They have an awkward parting; he’s off to Oxford to become ordained (as a minister). The Dashwood sisters, Col. Brandon, and Mrs. Jennings travel to Cleveland (the home of the Palmers). Everyone admires the newborn baby boy. After a long walk in cold/rainy weather, Marianne falls ill. It grows serious quickly- the doctor says it’s a “putrid infection.” Fearing for the baby, the Palmers leave the house, but Mrs. Jennings stays behind. The doctor comes each day to check on the patient. Col. Brandon hastens to fetch Mrs. Dashwood. Elinor is surprised to see Willoughby, who demands an audience with her to explain himself. He admits that he went to the countryside to amuse himself, but fell in love with Marianne. When Lady Allen heard about another event (the birth of a baby to Col. Brandon’s ward), she called him back to her side. She suggested that he marry the poor girl, but he couldn’t bring himself to do that. He could only think of Marianne. Since he was disowned by his aunt and had many debts, he hastily secured Miss Grey, who had recently come into her inheritance. He hopes that she will hate him less now. Seeing his misery, Elinor feels sorry for him, but doesn’t forgive his earlier behavior. She feels that his wife at least deserves his respect. Before Mrs. Dashwood arrives, Marianne is out of danger. She invites Col. Brandon to see her to thank him. The gentleman is greatly affected by this, Elinor notices. Col. Brandon escorts the ladies home to Barton cottage. As she recovers, Marianne speaks less, tries to be cheerful, and returns to playing her piano. She’s determined to read more; there are books at Barton Park and Delaford that she can borrow. Marianne reveals to Elinor how she now feels regarding Willoughby. She feels pity, for the most part. She regrets her selfish, ungrateful, and unfair behavior to her family, friends, and acquaintances. But most of all, Marianne says she owes the biggest apology to Elinor. One of their manservants, Thomas, explains that he saw Mrs. Ferrars (Lucy Steele) in a coach going through the town. She said she was recently married. Thomas said that Mr. Ferrars (Edward, he assumed) was also in the coach, but was leaning back and didn’t say anything. They are all surprised and saddened to hear this, especially Elinor. She wonders how Lucy and Edward’s life will be in the nearby parsonage. They think Col. Brandon is coming for a visit, but the gentleman on horseback turns out to be Edward. He’s nervous about being there, they all notice. Elinor asks about “Mrs. Ferrars,” and Edward says: “My mother is in town.” Then, she rephrases it to “Mrs. Edward Ferrars.” Awkwardly, he explains that they must mean “Mrs. Robert Ferrars.” His brother has married Lucy. Elinor is overcome with (happy) emotion, bursts into tears, and leaves the room. He leaves for the village. The next afternoon, Edward comes back to propose to Elinor. “He was one of the happiest of men,” as he was released from his previous engagement (“boyish attachment”) to Lucy. Edward could now be more free with the Dashwoods. He wished he’s had some sort of employment at 18, but there was nothing for him to do but “fancy myself in love” at 19. He felt at home with Lucy’s family (unlike his own), and thought she was “a very pretty girl.” He knew little of other women then. Elinor is surprised by how happy she is, being engaged to Edward. They spend a week together, talking openly. She was confused by Robert and Lucy’s marriage. He never thought her a beauty. Perhaps “vanity” and “flattery” brought them together, Edward says. Lucy wrote him a letter saying that “her affections had transferred” from him to his brother after he was disowned. Edward wants to meet and apologize to Col. Brandon (who will be his future patron). He no longer resents being offered the Delaford parsonage, and wishes to see it. Col. Brandon visits Barton Cottage and learns all that recently passed. He and Edward get to know (and like) each other. The main concern in Col. Brandon’s mind is the difference in his and Marianne’s ages. After Edward spends some time at the parsonage, he and Col. Brandon travel to London. Edward makes things better with his mother, so is brought into the family again. Apprehensively, he tells her of his engagement to Elinor. Mrs. Ferrars eventually consents, and gives him an inheritance (equal to what was given to Fanny). Edward and Elinor marry in Barton church. They fix up the parsonage to their liking. Mrs. Ferrars, John and Fanny visit them in their new home. John hopes that Col. Brandon will soon marry Marianne. Mrs. Ferrars is reconciled to Robert within a few months. Lucy flattered her whenever possible, so Robert became her favorite son once more. Robert and Lucy settled in London, with help from his mother.